64 • SPONSORED CONTENT • FEBRUARY 2019 T o many restaurant patrons, the term "wood-fired cooking" conjures up just one name: Firebirds® Wood Fired Grill. The chain, headquartered in Charlotte, N.C. is renowned for the true wood- fired flavor they bring to all their steak entrees as well as specialty menu items such as salmon and burgers. Along with a full range of entrees, sides and desserts, Firebirds offers a complete beverage program with beer, wine, cocktails, and craft sodas. Diners are certainly "fired up" about Firebirds, and this rapidly expanding "polished dining" chain with locations in 19 states currently will soon open its 50th location. Serving hundreds of customers every night demands a lot of cooler and freezer space. 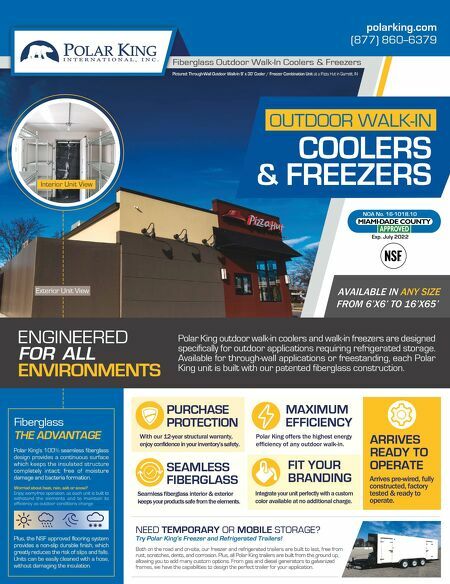 Firebirds has a unique solution for its cold storage needs: a customized fiberglass three-in-one combination cooler, freezer and beer cooler from Polar King, located outside of the restaurant. Like all Polar King units, this three-compartment combination walk-in comes fully assembled in one piece, prewired and ready for operation. Alvin Hood, Director of Construction for Firebirds, says that having the unit located outside the kitchen "saves about 340 square feet of our building footprint." The solid construction of the Polar King walk-in is, he says, "superior to knockdown units…stronger and more stable." Steve Sturm, Executive Chef for Firebirds, says that "because it's a fiberglass construction, we are not see- ing the deterioration you typically see on the galvanized units." That's important at a location such as Firebirds' Jacksonville, Fla., restaurant, he notes. "It's one of the reasons why we went with this particular unit, because it wouldn't react to the salt air. We feel that the long-term maintenance and cost of ownership is going to be signifi- cantly reduced." The fact that the Polar King combination walk-in comes completely assembled is a time and money saver, says Hood. "It comes prewired. It reduces time from the electri- cian, running conduit into coolers." Long-term, Firebirds expects to see energy savings with the Polar King unit, says Hood. "It has an equal or better R value than what we were using," he says. "Be- cause it's one unit, insulated, there's no seals to go bad and air to leak in or out. So you've got a better contain- ment system." Part of Polar King's customization process for Firebirds is matching the unit's exterior to the Firebirds design, so that the unit doesn't look like an afterthought. "We can take elements off the building and apply it to the cooler wall, which adjoins our service area. That makes it blend in," Hood says. "Probably 90 percent of the people who go to our restaurants don't even realize it's a cooler/freezer on the exterior. They think it's part of the building." Most importantly, Firebirds knows they're getting a quality product that will give them years of dependable service. "It's going to be a lifetime investment," says Hood. "There's no reason to think we couldn't get 20 years out of it." Comparing the Polar King with previous cooler units, he says, "We're just getting a better product overall." 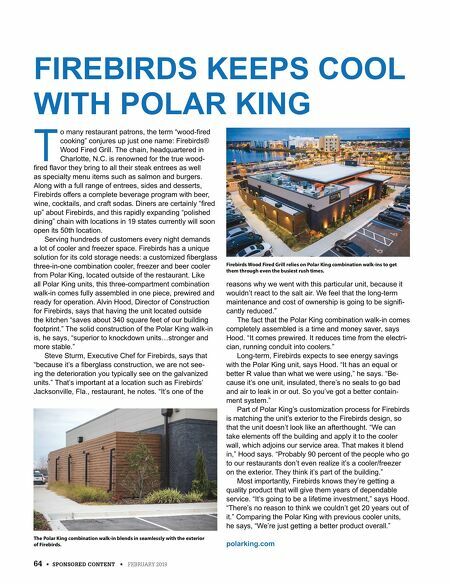 polarking.com FIREBIRDS KEEPS COOL WITH POLAR KING Firebirds Wood Fired Grill relies on Polar King combination walk-ins to get them through even the busiest rush times. The Polar King combination walk-in blends in seamlessly with the exterior of Firebirds.